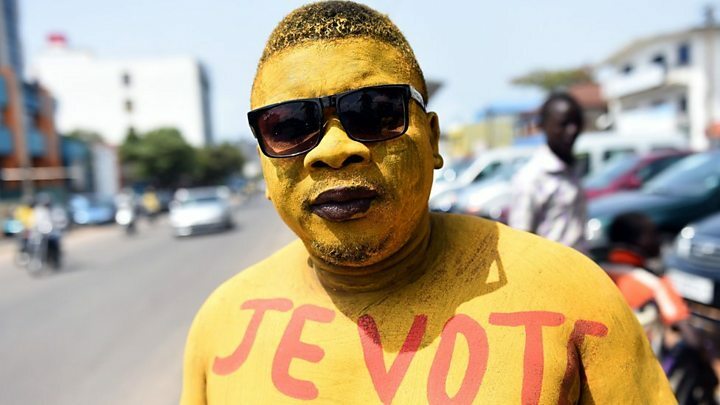 Media captionA guide to Africa's "Super Sunday"
Elections have taken place in five African countries, while Senegal held a referendum on reducing presidential terms. 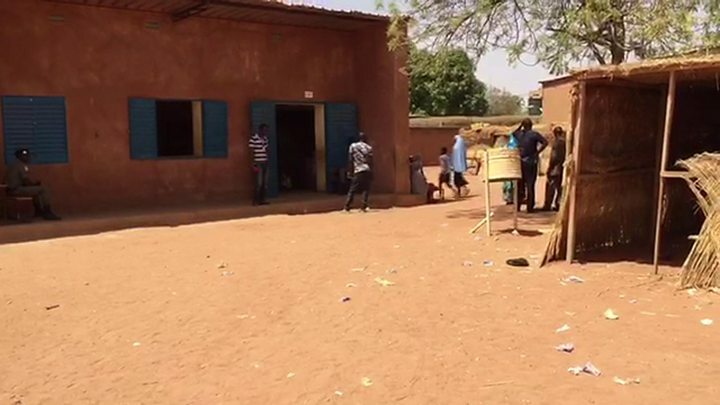 A presidential run-off went ahead in Niger even though the opposition candidate was in a French hospital. Congo-Brazzaville has cut all telecommunications for two days to prevent "illegal publication of results" of its presidential election. Elections were also held in Benin, Cape Verde and Zanzibar. Riot police used tear gas to disperse dozens of opposition supporters who alleged vote irregularity after voting ended in the capital. Opposition groups are reported to have been denied access to the counting of ballots. Before voting day, Congolese Interior Minister Raymond Mboulou had ordered telephone operators to cut all communications - telephone, text messages and the internet. Only a few official numbers were excluded from the ban. The government had also outlawed the use of motor vehicles nationwide during the vote, except for those with special permits. The opposition had condemned the communications blackout, saying it would prevent election monitors from doing their job, and warned of rigging. General Jean-Marie Michel Mokoko is seen as the strongest challenger to President Denis Sassou Nguesso. Mr Sassou Nguesso has been in power since 1979, except for a five-year period after losing elections in 1992. The constitution was changed after an October referendum to remove term and age limits which would have prevented the 72-year-old from standing again. 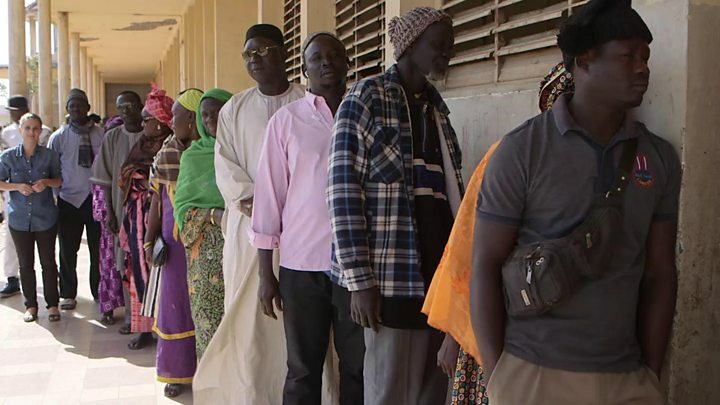 The opposition in Niger called for a boycott of the election, alleging fraud, and the BBC's Ishaq Khalid said he had not seen many voters in the capital, Niamey. President Muhamadou Issoufou is expected to win a second term in a contest also featuring former prime minister and parliamentary speaker Hama Amadou. Mr Amadou was jailed in November on baby-trafficking charges, which he denies. He was flown to Paris last week for medical treatment. His medical condition is unclear, but his health reportedly deteriorated in prison. One of the world's poorest countries, Niger faces a growing jihadist threat and was attacked by militants from al-Qaeda and Boko Haram on Thursday. In February's first round, Mr Issoufou got 48% of the vote while Mr Amadou came second with 17%. Security was tight in Zanzibar after violent protests over recent elections. The BBC's Tulanana Bohela reported that there were not many voters in the polling stations she visited. 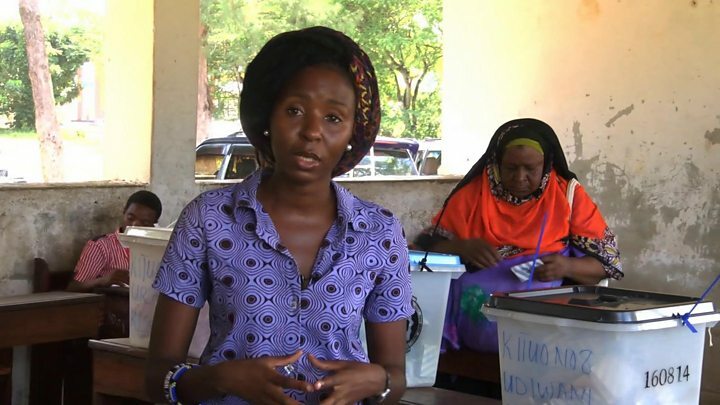 The opposition Civic United Front (CUF) had urged its supporters to boycott the poll. October's election was cancelled after CUF candidate Seif Sharif Hamad declared himself the winner before results were officially announced. CUF says the annulment was because it had won, while the electoral commission said there had been widespread fraud. With the CUF boycotting, President Ali Mohamed Shein of the Chama Cha Mapinduzi, which is in power across Tanzania, looks set to be re-elected. As the polls closed, election official Salum Kassim Ali said he had not "received any big complaints. The vote counting is under way and the results will be out as soon as possible, and within 72 hours". The new constitution that was voted on in Senegal would cut presidential mandates from seven to five years and would not allow a president to run for more than two consecutive terms in office. The BBC's Maud Jullien in Dakar says it is an unusual move on a continent where many leaders are trying to extend their time in office as much as possible. It may serve to boost Senegal's image abroad as a strong democracy, but, locally, the referendum has prompted some criticism, she says. President Macky Sall's critics say he had promised to reduce his current term but is not doing so and the new constitution, if passed, would only affect future presidential terms. Our reporter says the referendum has become a popularity test for the president rather than a debate on the issues at stake. Turnout for Sunday's vote is reported to have been low. Prime Minister Lionel Zinsou, a former investment banker, has conceded defeat to Patrice Talon, the "king of cotton" in the presidential run-off, AFP reported. Official results are yet to be announced, but Mr Zinsou said his rival had won a "decisive victory". If confirmed, it will be a turnaround for Mr Talon, who came slightly behind Mr Zinsou in the first round: 28% to 25%. President Thomas Boni Yayi is standing down after serving two terms in office. Mr Talon used to be a close ally of President Boni Yayi but was accused of masterminding a plot to poison him in 2012. He fled to France but returned last year after receiving a presidential pardon. With most votes counted, the opposition Movement for Democracy (MPD) is set to win an absolute majority, ousting the African Party for the Independence of Cape Verde (PAICV) after 15 years in power. Both parties have dominated politics since independence from Portugal in 1975. The Prime Minister-elect, Ulisses Correia e Silva said the vote demonstrated Cape Verdeans' desire to move towards a brighter economic future. Presidential elections are expected later this year.